Almonds are very tasty and so beneficial for our health. They are my favourite nut; most mornings I add 7 to 10 almonds to my breakfast. ‘Bad’ Cholesterol is Lowered: One clinical study showed that almonds added to the diet had a favorable effect on blood cholesterol levels and that none of the study groups experienced weight gain in the study by Dr. Gene Spiller, Director of the Health Research and Studies Center, Inc.
Reduce Heart Attack Risk: A study showed those who consumed nuts five times a week had a 50% reduction in risk of heart attack according to the Loma Linda School of Public Health. Good brain function: Almonds contain riboflavin and L-carnitine, nutrients that boost brain activity which may also reduce the risk of Alzheimer’s disease. A nutrient for the nervous system according to Ayurveda; they help to increase high intellectual level and longevity. They alkalize the body: Almonds are the only nut and one of the few proteins that are alkaline forming. When your body is not alkaline enough, you risk osteoporosis, poor immune function, low energy and weight gain. 2.51 million tonnes of almonds were produced in 2010 according to Food and Agriculture Organization. This is one very nutrient-dense food which we call a Superfood. Provide 266mg (27% DV) of calcium per 100g serving, 367mg (37% DV) per cup. Full of potassium, phosphorus and iron. One of the best whole food sources of vitamin E, with about one third of the daily value per ounce. 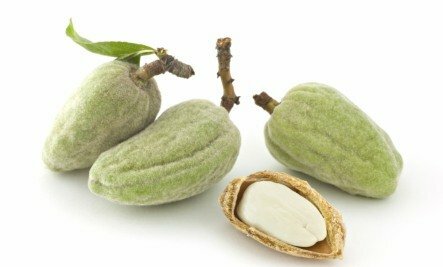 The almond tree is one of the earliest domesticated tree nuts because wild almonds produces cyanide; even eating a few dozen at one time can be fatal. Keep them in an airtight container to protect them from air so the oil does not go rancid. Almonds keep best in a dark, cool environment such as your refrigerator for up to two years according to the Almond Board of California. Wait till children are at least one year old before feeding them any kind of nuts. Almond flour is great in gluten free cooking and baking. 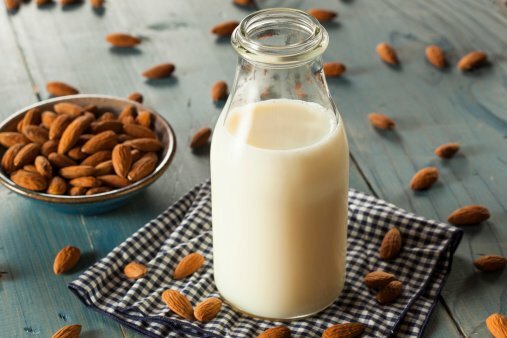 Almond Milk with its mild flavour and light colour is a very good alternative for those that need to be dairy free, soy free and for vegans. Green almonds are dipped in sea salt and eaten as snacks on Iran street markets. 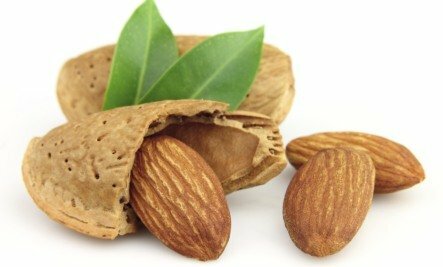 Eat almonds with the skin as it contains more than 20 antioxidant flavanoids. Nourishing for your skin and hair: rub a little cold pressed Sweet Almond Oil on to the skin to moisturize it. Almonds are so good for us that I use them in all my Healthy Diets and Detoxes. Thank you foe all the great information. Diana Herrington of Real Food For Life wrote an article on that at : https://www.realfoodforlife.com/sprouting-nuts-seeds/ Thanks for your participation! Pierrette soaks them overnight.We blend them with water to make the greatest nut milk ever and use it to make our fruit smoothies every morning for the whole family. The fruits act as “eliminators” and help to improve the digestive flow. We do not need all the fibre and having juice is the best way to get all the nutritional values from fruits and vegetables without all the calories. Hi! Do you think almond milk is better than rice milk, which i’ve been using for years? Thanks. Pierre, you two do much like I do; I love almond milk. Yes you are so on right about all the goodness. However, these people: http://www.organicpastures.com/raw_almonds.html sell truly raw almonds. Thank you Kevin for the links which US people will appreciate. I am happy that in Canada we can easily get raw almonds; we just do not get them from the US any more if we want raw almonds. I believe that the US is the only place in the world to not have an easy supply of raw almonds. Thanks for the great info on almonds! I’m glad to hear that almonds are alkaline forming. Previously I had heard that macadamias were the only alkaline forming nuts. If both are right, that’s great news, because that means my two favorite nuts are both alkaline forming. and the good thing about almonds,(tried and tested many times) after about 3 weeks of having about 60 a day wth weight traing u see amazing results! I eat almonds in several forms and love them! You haven’t mentioned almond butter. What about the nutritional value of roasted or raw almond butter, since neither are soaked first? I do use soaked ground almonds in my smoothies every morning plus almond milk. Sunny, I believe almond butter that is roasted would have much of the nutrition in them except that mostly they do add some extra oil to create a smoother consistency. Raw almond butter is one of those foods I do not buy as I do not think it is as digestible. You can make your own which I hear is a lot of work using raw almonds that you soakeds, then dehydrate and then blended for a long time. Rose, in my baking I use blanched almond flour which means the almonds that have had their skin removed. The skin is where many of the nutrients are. You could make your own almond meal with the skins on but probably will not work so well in baking. Also, because it is blanched you will get many of the other nutrients as the blanching will stop the enzyme inhibitor from blocking the absorbtion of nutrients. The reason it does not have that much in nutrients is because to make the almond milk you have to use lots of water. See the Almond milk recipe we have here. Sorry I do not keep track of specific nutrients in foods. There are many sites that specialize in that and that is all they do. I know a lot about the health benefits of almonds so that’s the reason why I started eating almonds since child. Hi Diana, Very informative article. Almonds are a natural super food. If substituted for high fat and low nutritional value snacks, they can help men of all ages attain a stronger, efficient body and a sharp mind.